By definition, teratomas include components derived from all three embryonic layers: ectoderm, endoderm, and mesoderm. These tissues are foreign to the location in which they are found. Teratomas may be classified as mature or immature on the basis of the presence of immature neuroectodermal elements within the tumor. Mature tumors (grade 0) have no immature elements. In grade 1 tumors, immature elements are limited to one low-power field per slide; in grade 2 tumors, fewer than four fields are present per slide; and in grade 3 tumors, more than four fields are present per slide. The risk of recurrence also appears to be related to the degree of immaturity. Recurrence in a completely resected mature teratoma is less than 10%; in an immature teratoma, recurrence may be as high as 33%. The likelihood of recurrence depends on the site of the tumor as well as the completeness of resection. The German MAKEI trials suggested that the recurrence rate for immature teratomas can be decreased to 9.5% with chemotherapy. Sacrococcygeal teratomas are more likely to recur than those in the ovary or other sites. Molecular biologic and cytogenetic studies are providing a firmer scientific basis to these observations. Mutter described genetic imprinting as a major factor in the development of some of these tumors. The developmentally expressed genes insulinlike growth factor 2 (IGF II) and its receptor RNA (H-19); small nuclear riboprotein (SNRPN); mas proto-oncogene; and the tumor suppressor genes WT1 and MASH2 are imprinted, depending on their maternal or paternal origin. Mutter suggested that these genes or the cells have only the maternal imprint because many teratomas arise from a parthenogenetically activated egg. Therefore, maternally active genes are present in higher than usual concentrations, and maternally inactive products are present at lesser concentrations if at all. These abnormalities may account for the lack of organization of the three germ cell layers. Hara et al suggested that the MAGE gene family of tumor rejection antigens may also be involved in the pathogenesis of these tumors. These genes appear to be more active in pure seminoma or mixed type of seminomatous elements than in other germ cell tumors. In their limited study of 22 patients, MAGE expression was not correlated with disease progression. It is likely to be only an indicator of maturity or differentiation of the tissues. When platinum-based chemotherapy–resistant tumors are evaluated, between one third and one half of tumors exhibit microsatellite instability. With sacrococcygeal teratomas, no causative agents are known. With respect to ovarian germ cell tumors, a familial predilection may be present. Cases in seven families have been reported in which female first-degree relatives had germ cell tumors. In an additional seven families, males had germ cell tumors. This observation suggests that certain genes may be present in these families, predisposing them to germ cell malignancy. One study that examined the effect of diet on the development of ovarian tumors revealed that diets high in polyunsaturated fat were associated with the development of teratomas. Likely, plant estrogens, and not the polyunsaturated fat, are associated with an increased tumor risk. Turner syndrome is similarly a risk factor for gonadoblastoma. Klinefelter syndrome has been linked with an increased risk of extragonadal malignant germ cell tumors. The highest risk seems to be among patients who carry some Y-chromosome genes in ectopic locations where they may not be normally regulated. Children with DSDs are typically male pseudohermaphrodites with antigen insensitivity or 5-alpha reductase deficiency. These patients with testicular feminization are sometimes discovered serendipitously during a hernia repair. Optimal timing for gonadal resection in these situations is a matter of debate. Gonadal estrogen production may benefit the patient in terms of growth and development. However, gonadoblastoma has been observed in patients as young as 2 months, and frank tumors have been observed in those younger than 2 years. The decision to leave or remove the gonads early should be made with the family after thorough discussion of these risks and potential benefits. Sacrococcygeal teratoma occurs in 1 in 30,000-70,000 live births. The female-to-male ratio is 4:1. Ovarian teratomas are almost as common, whereas testicular teratomas are about one third less frequent. The overall incidence of malignant germ cell tumors is approximately 3% of all childhood malignancies, or approximately 3 cases per million population per year. The frequency of all germ cell tumors has increased over the last several decades. Sacrococcygeal teratomas are congenital. Those with a significant external component (see the image below) are identified at birth. Tumors without an external component (Altman type 4) are discovered later. When the tumors are resected before the patient is aged 2 months, 7-10% are malignant. After that age, the risk of malignancy increases greatly, exceeding 50% by age 1 year. Sacrococcygeal teratoma in a female neonate. This particular tumor is largely external with no intrapelvic extension. 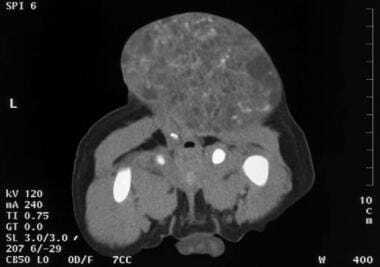 This is an ovarian mixed germ cell tumor in a 13-year-old girl. This tumor caused right lower quadrant pain. It is largely cystic in composition. No calcifications are observed within the mass. Benign ovarian tumors, largely teratomas, predominate. Roughly 70% of malignant ovarian tumors in childhood are germ cell tumors, one quarter are epithelial, and the remainder are stromal tumors. The ratio of germ cell tumors to epithelial malignancies decreases with increasing patient age. Chromosomal abnormalities also appear to be related to age at presentation for teratomas. In girls younger than 5 years, no chromosomal abnormalities were found, whereas older girls often have gains of 12p and chromosomes 7 and 8. Testicular germ cell tumors in childhood are split between teratomas and yolk sac tumors (see the image below). They are more common from birth to age 5 years. From age 6 years until puberty, testicular tumors are exceedingly uncommon. Thereafter, the incidence increases, with a more adultlike tumor pattern with seminomas gradually becoming the predominant histology. Yolk sac tumor of the testis. 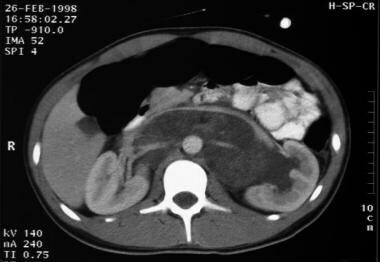 The tumor is metastatic to the retroperitoneum. It encases the aorta and renal arteries. The vena cava and renal veins are displaced anteriorly by the mass. Both teratomas and yolk sac tumors may be associated with contralateral in-situ dysgenesis in 9% of patients compared with 0.5% of otherwise healthy males. Contralateral tumors are often found. These are occasionally synchronous but are more often metachronous. Ongoing surveillance of the contralateral testis is therefore needed. Sacrococcygeal teratoma has a 4:1 female-to-male predominance. In other germ cell tumors, the female-to-male ratio is roughly 2:1 in children. Mortality for congenital teratomas depends on gestational age and the size and location of the tumors. Survival of preterm infants younger than 30 weeks' gestation with sacrococcygeal teratoma is only 7%, whereas the survival for infants older than 30 weeks' gestation is 75%. Rapid early growth is associated with the yolk-sac phenotype and carries a poorer prognosis. Early tumors are frequently large relative to the size of the infant and may induce congestive heart failure. Cervical teratomas may frequently lead to airway problems and death when they are large. Before current developments in chemotherapy, the 10-year survival rate for malignant germ cell tumors ranged from 25% for embryonal carcinoma to 75% for dysgerminoma. Today, overall survival rates are greater than 90%. Now that survival of most patients is approaching 100%, the morbidity of treatment, particularly fertility,  must be addressed. Because these patients are often prepubertal, standard means of collecting and preserving sperm or ova are not applicable. Techniques for preserving normal gonadal tissue and maturing it to produce viable sperm and ova must be developed. Long-term follow-up of these patients is necessary because of the possibility of chronic pulmonary disease, hearing loss, and other long-term toxicities of the chemotherapy used in treating these lesions. In a single-center retrospective study evaluating long-term outcomes in 25 pediatric patients (N=25) with a primary mediastinal germ cell tumor, six patients were treated with resection alone and were cured without disease recurrence or progression, whereas 19 were treated for malignancy and had a 5-year overall survival of 0.39±0.12. The authors identified localized disease, complete resection, and platinum-based chemotherapy as factors linked with improved survival in malignant nonseminomatous mediastinal germ cell tumors, and they concluded that neoadjuvant platinum-based three-drug regimens followed by delayed surgical resection was the appropriate treatment modality for these tumors. Two patients died of recurrent disease, and one patient died of secondary acute myelocytic leukemia. Toxicity was limited with this drug regimen; occasional low-grade toxicity to the renal, pulmonary, and auditory systems were reported. More severe hematologic toxicities were reported. The 2004 Intergroup high-risk germ cell trial compared standard-dose BEP treatment with high-dose BEP treatment. [27, 28] Although substantial improvement in EFS was noted in the high-dose arm, OS was not significantly improved, and serious renal toxicity (7% reduced creatinine clearance) and ototoxicity (14% testable hearing loss) were frequent. Because the high-stage extragonadal germ-cell tumors had substantially reduced survival compared with all other groups, more aggressive therapy may be warranted in those patients. Billmire D, Vinocur C, Rescorla F. Outcome and staging evaluation in malignant germ cell tumors of the ovary in children and adolescents: an intergroup study. J Pediatr Surg. 2004 Mar. 39(3):424-9; discussion 424-9. [Medline]. Billmire D, Vinocur C, Rescorla F, et al. Malignant mediastinal germ cell tumors: an intergroup study. J Pediatr Surg. 2001 Jan. 36(1):18-24. [Medline]. Billmire D, Vinocur C, Rescorla F, et al. Malignant retroperitoneal and abdominal germ cell tumors: an intergroup study. J Pediatr Surg. 2003 Mar. 38(3):315-8; discussion 315-8. [Medline]. Bromen K, Stang A, Baumgardt-Elms C. Testicular, other genital, and breast cancers in first-degree relatives of testicular cancer patients and controls. Cancer Epidemiol Biomarkers Prev. 2004 Aug. 13(8):1316-24. [Medline]. Gobel U, Calaminus G, Schneider DT, Koch S, Teske C, Harms D. The malignant potential of teratomas in infancy and childhood: the MAKEI experiences in non-testicular teratoma and implications for a new protocol. Klin Padiatr. 2006 Nov-Dec. 218(6):309-14. [Medline]. Kildal W, Kaern J, Kraggerud SM. Evaluation of genomic changes in a large series of malignant ovarian germ cell tumors--relation to clinicopathologic variables. Cancer Genet Cytogenet. 2004 Nov. 155(1):25-32. [Medline]. Sakurai H, Asamura H, Suzuki K. Management of primary malignant germ cell tumor of the mediastinum. Jpn J Clin Oncol. 2004 Jul. 34(7):386-92. [Medline]. Faure-Conter C, Rocourt N, Sudour-Bonnange H, Vérité C, Martelli H, Patte C, et al. Pediatric germ cell tumours. Bull Cancer. 2013 Apr 1. 100(4):381-391. [Medline]. Charoenkwan P, Senger C, Weitzman S, et al. Significance of p53 expression in immature teratomas. Pediatr Dev Pathol. 2002 Sep-Oct. 5(5):499-507. [Medline]. Gobel U, Schneider DT, Calaminus G, et al. Multimodal treatment of malignant sacrococcygeal germ cell tumors: a prospective analysis of 66 patients of the German cooperative protocols MAKEI 83/86 and 89. J Clin Oncol. 2001 Apr 1. 19(7):1943-50. [Medline]. Teilum G. Classification of endodermal sinus tumour (mesoblastoma vitellinum) and so-called "embryonal carcinoma" of the ovary. Acta Pathol Microbiol Scand. 1965. 64(4):407-29. [Medline]. Mutter GL. Role of imprinting in abnormal human development. Mutat Res. 1997 Dec 12. 396(1-2):141-7. [Medline]. Oosterhuis JW, Looijenga LH, van Echten J, de Jong B. Chromosomal constitution and developmental potential of human germ cell tumors and teratomas. Cancer Genet Cytogenet. 1997 May. 95(1):96-102. [Medline]. Hara I, Hara S, Miyake H, et al. Expression of MAGE genes in testicular germ cell tumors. Urology. 1999 Apr. 53(4):843-7. [Medline]. Biskup W, Calaminus G, Schneider DT, Leuschner I, Gobel U. Teratoma with malignant transformation: experiences of the cooperative GPOH protocols MAKEI 83/86/89/96. Klin Padiatr. 2006 Nov-Dec. 218(6):303-8. [Medline]. Takahashi M, Okumura N, Matsuoka T, Yamashina A, Nakano J, Kameyama K. Teratoma with naturally occurring malignant transformation in a child. Ann Thorac Cardiovasc Surg. 2011. 17 (6):588-90. [Medline]. Britton JA, Westhoff C, Howe G, Gammon MD. Diet and benign ovarian tumors (United States). Cancer Causes Control. 2000 May. 11(5):389-401. [Medline]. Hassan AB, Mead GM. Germ cell cancers in adult males are associated with a history of infantile pyloric stenosis. Eur J Cancer. 1997 May. 33(6):970-2. [Medline]. English PB, Goldberg DE, Wolff C, Smith D. Parental and birth characteristics in relation to testicular cancer risk among males born between 1960 and 1995 in California (United States). Cancer Causes Control. 2003 Nov. 14(9):815-25. [Medline]. Canto P, Kofman-Alfaro S, Jimenez AL, et al. Gonadoblastoma in Turner syndrome patients with nonmosaic 45,X karyotype and Y chromosome sequences. Cancer Genet Cytogenet. 2004 Apr 1. 150(1):70-2. [Medline]. Aguirre D, Nieto K, Lazos M, Pena YR, Palma I, Kofman-Alfaro S. Extragonadal germ cell tumors are often associated with Klinefelter syndrome. Hum Pathol. 2006 Apr. 37(4):477-80. [Medline]. La Vecchia C, Morris HB, Draper GJ. Malignant ovarian tumours in childhood in Britain, 1962-78. Br J Cancer. 1983 Sep. 48(3):363-74. [Medline]. Hall C, Ritz B, Cockburn M, Davidson TB, Heck JE. Risk of malignant childhood germ cell tumors in relation to demographic, gestational, and perinatal characteristics. Cancer Epidemiol. 2017 Feb. 46:42-49. [Medline]. Herrmann ME, Thompson K, Wojcik EM, Martinez R, Husain AN. Congenital sacrococcygeal teratomas: effect of gestational age on size, morphologic pattern, ploidy, p53, and ret expression. Pediatr Dev Pathol. 2000 May-Jun. 3(3):240-8. [Medline]. Zanetta G, Bonazzi C, Cantu M, et al. Survival and reproductive function after treatment of malignant germ cell ovarian tumors. J Clin Oncol. 2001 Feb 15. 19(4):1015-20. [Medline]. Grabski DF, Pappo AS, Krasin MJ, Davidoff AM, Rao BN, Fernandez-Pineda I. Long-term outcomes of pediatric and adolescent mediastinal germ cell tumors: a single pediatric oncology institutional experience. Pediatr Surg Int. 2017 Feb. 33 (2):235-244. [Medline]. Rogers PC, Olson TA, Cullen JW. Treatment of children and adolescents with stage II testicular and stages I and II ovarian malignant germ cell tumors: A Pediatric Intergroup Study--Pediatric Oncology Group 9048 and Children's Cancer Group 8891. J Clin Oncol. 2004 Sep 1. 22(17):3563-9. [Medline]. Cushing B, Giller R, Cullen JW, Marina NM, Lauer SJ, Olson TA, et al. Randomized comparison of combination chemotherapy with etoposide, bleomycin, and either high-dose or standard-dose cisplatin in children and adolescents with high-risk malignant germ cell tumors: a pediatric intergroup study--Pediatric Oncology Group 9049 and Children's Cancer Group 8882. J Clin Oncol. 2004 Jul 1. 22 (13):2691-700. [Medline]. Shah RU, Lawrence C, Fickenscher KA, Shao L, Lowe LH. Imaging of pediatric pelvic neoplasms. Radiol Clin North Am. 2011 Jul. 49(4):729-48, vi. [Medline]. 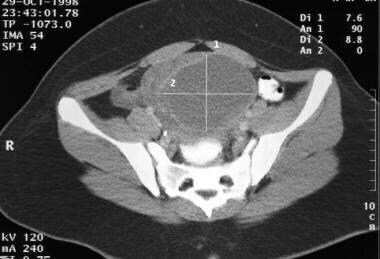 Yamaoka T, Togashi K, Koyama T, Fujiwara T, Higuchi T, Iwasa Y. Immature teratoma of the ovary: correlation of MR imaging and pathologic findings. Eur Radiol. 2003 Feb. 13(2):313-9. [Medline]. Beroukhim RS, Prakash A, Buechel ER, Cava JR, Dorfman AL, Festa P, et al. Characterization of cardiac tumors in children by cardiovascular magnetic resonance imaging: a multicenter experience. J Am Coll Cardiol. 2011 Aug 30. 58(10):1044-54. [Medline]. Veltman I, Veltman J, Janssen I, Hulsbergen-van de Kaa C, Oosterhuis W, Schneider D. Identification of recurrent chromosomal aberrations in germ cell tumors of neonates and infants using genomewide array-based comparative genomic hybridization. Genes Chromosomes Cancer. 2005 Aug. 43(4):367-76. [Medline]. Chieffi P, Chieffi S. An up-date on newly discovered immunohistochemical biomarkers for the diagnosis of human testicular germ cell tumors. Histol Histopathol. 2014 Aug. 29(8):999-1006. [Medline]. Cowles RA, Stolar CJ, Kandel JJ, Weintraub JL, Susman J, Spigland NA. Preoperative angiography with embolization and radiofrequency ablation as novel adjuncts to safe surgical resection of a large, vascular sacrococcygeal teratoma. Pediatr Surg Int. 2006 Jun. 22(6):554-6. [Medline]. Yalçin B, Demir HA, Tanyel FC, Akçören Z, Varan A, Akyüz C, et al. Mediastinal germ cell tumors in childhood. Pediatr Hematol Oncol. 2012 Oct. 29(7):633-42. [Medline]. Sudour-Bonnange H, Faure-Conter C, Martelli H, Hameury F, Fresneau B, Orbach D, et al. Primary mediastinal and retroperitoneal malignant germ cell tumors in children and adolescents: Results of the TGM95 trial, a study of the French Society of Pediatric Oncology (Société Française des Cancers de l'Enfant). Pediatr Blood Cancer. 2017 Mar 17. [Medline]. Hartmann JT, Rick O, Oechsle K. Role of postchemotherapy surgery in the management of patients with liver metastases from germ cell tumors. Ann Surg. 2005 Aug. 242(2):260-6. [Medline]. Huyghe E, Matsuda T, Daudin M. Fertility after testicular cancer treatments: results of a large multicenter study. Cancer. 2004 Feb 15. 100(4):732-7. [Medline]. Sagae S, Sasaki H, Nishioka Y, Terasawa K, Kudo R. Reproductive function after treatment of malignant germ cell ovarian tumors. Mol Cell Endocrinol. 2003 Apr 28. 202(1-2):117-21. [Medline]. Park JY, Kim DY, Suh DS, Kim JH, Kim YM, Kim YT, et al. Outcomes of pediatric and adolescent girls with malignant ovarian germ cell tumors. Gynecol Oncol. 2015 Jun. 137 (3):418-22. [Medline]. Kollmannsberger C, Schleucher N, Rick O, et al. Analysis of salvage treatments for germ cell cancer patients who have relapsed after primary high-dose chemotherapy plus autologous stem cell support. Eur J Cancer. 2003 Apr. 39(6):775-82. [Medline]. Ovarian yolk sac tumor at surgery. Esophagram in an infant with massive thoracic germ cell tumor. Note how the esophagus is displaced posteriorly and laterally by the left mediastinal tumor. Chest radiograph of the patient in Media file 5 after treatment with chemotherapy. The size of the tumor has not decreased. CT scan of the chest in the patient in Media file 6. The carina is displaced posteriorly and to the right. The vena cava is displaced anteriorly, and the aorta is compressed between the mass and the spine.